Get your high quality air suspension replacement parts for wide variety of models from Aerosus Germany with 2 year warranty and express delivery! A total of 2 reviews for Aerosus.co.uk have been written yet. The most recent reviews are listed below. I let them do the work in replacing my air suspension. Thanks for the great service! 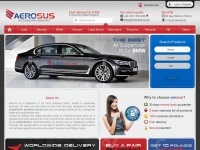 I purchased an air suspension compressor from Aerosus UK for my German manufactured vehicle at what I thought would be a considerable saving from the price of a dealer sourced part. Aerosus customer services confirmed that as a private purchaser I was eligible for a 2 year warranty and a 30 day money back guarantee. Their website would not accept payment via credit card, which their customer services said was due to a recent upgrade in their online payment systems. They would not accept payment over the telephone. I opted for cash on delivery at an extra £10 and express 1 to 2 business day delivery. The package arrived a day late on business day 3. My garage confirmed the compressor pump was WABCO branded with an Aerosus sticker on top. The relay with the pump looked questionably generic and simply stamped "made in China". The pump and relay supplied were fitted to my car, and ran OK for just one week before the pump started to make noises and rattle. At this point I raised a returns request with Aerosus and was asked to ship the pump back to Germany. I sent it next day delivery via UPS at a small fortune in cost. Aerosus took delivery of the pump but they didn't send any communication acknowledging receipt. When I contacted them, they said their technicians would look at it. I received no communications from Aerosus except email replies to my own telling me just to be patient. After one week and no update from Aerosus, my garage telephoned me to say that Aerosus had returned the damaged compressor with a cover note stating the pump had overheated and gave four possible underlying causes and stated the issue was the car itself and not the pump and they would not be providing a replacement. My garage had checked the suspension system throughly before fitting the Aerosus pump and the only remaining possible cause of the failed pump was the Relay, which Aerosus had supplied with the pump!! I have telephoned and left messages with Aerosus asking the person dealing with my case to telephone me and they have not had the courtesy to do so. I then received an email copy of the note that had been sent to my garage. Both the garage and I have contacted Aerosus further to try to find an amicable solution but Aerosus have not responded with any helpful reply. I have since taken my car to be repaired by my vehicle dealership where they have diagnosed the issue as with the compressor pump and relay supplied by Aerosus. They have checked the entire system and confirmed there are no other faults with the suspension system on my vehicle. I have contacted Aerosus with this information and again requested a refund and my communications have gone ignored and unanswered so far.